LASIK (Laser in-situ Keratomileusis) is used to correct or reduce moderate to high levels of nearsightedness (myopia), astigmatism and farsightedness (hyperopia). The traditional LASIK procedure is relatively simple: a keratome is used to gently create a flap in the cornea. In IntraLASIK, the flap is created by a computer-controlled, precision laser. The flap is lifted and an excimer laser is then used to shape the remaining tissue. The flap is then carefully set back into place, forming an occlusive seal by osmopic pressure. Osmopic pressure holds the flap in place and allows it to heal very quickly, without stitches! Studies have shown that the LASIK procedure causes the least amount of discomfort when compared to all other types of refractive surgeries. 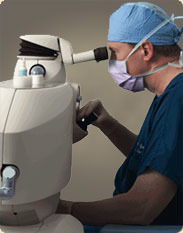 Patients have also reported an almost immediate improvement in their vision following the LASIK procedure. Most patients say they experience little or no discomfort during or after the procedure. ARE YOU A CANDIDATE FOR LASIK OR INTRALASIK? Are at least 18 years of age with - 1 to - 12 diopters of nearsightedness. Have healthy eyes that are free from severe retinal disorders, corneal disorders, or any eye disease that would make the surgery contraindicated. Have had stable vision for the past year. Have no abnormalities that could affect healing (such as severe diabetic eye disease). Are fully informed about the risks and benefits of laser surgery compared with other available treat without your glasses or contact lenses. Do you think that you’re a good candidate for LASIK laser vision correction but still want to learn a little more and get a professional opinion? To help determine if LASIK is right for you, Boothe Eye Care & Laser Center offers a FREE initial screening. To set up an appointment, please contact us directly at 214-328-0444.